The 2012 health profile from Lincoln released on Tuesday shows the health of people in the city is generally worse than the England average. The report found life expectancy for both men and women in Lincoln is lower than the England average, and much worse in deprived areas of the city. Deprivation is higher than average and about 4,000 children live in poverty, and life expectancy is 10.6 years lower for men and 5.8 years lower for women in these areas. More than 20% of Year 6 children are classified as obese, the report found. Levels of teenage pregnancy, alcohol-specific hospital stays among those under 18 and smoking in pregnancy are worse than the England average. An estimated 20.2% of adults smoke and 23.6% are obese. Rates of sexually transmitted infections, smoking related deaths and hospital stays for alcohol related harm are worse than the England average. Over the last 10 years, all cause mortality rates have fallen, but the early death rate from heart disease and stroke has fallen but is worse than the England average. Lincoln is classed below the England average in most of the measurements in the health profile. 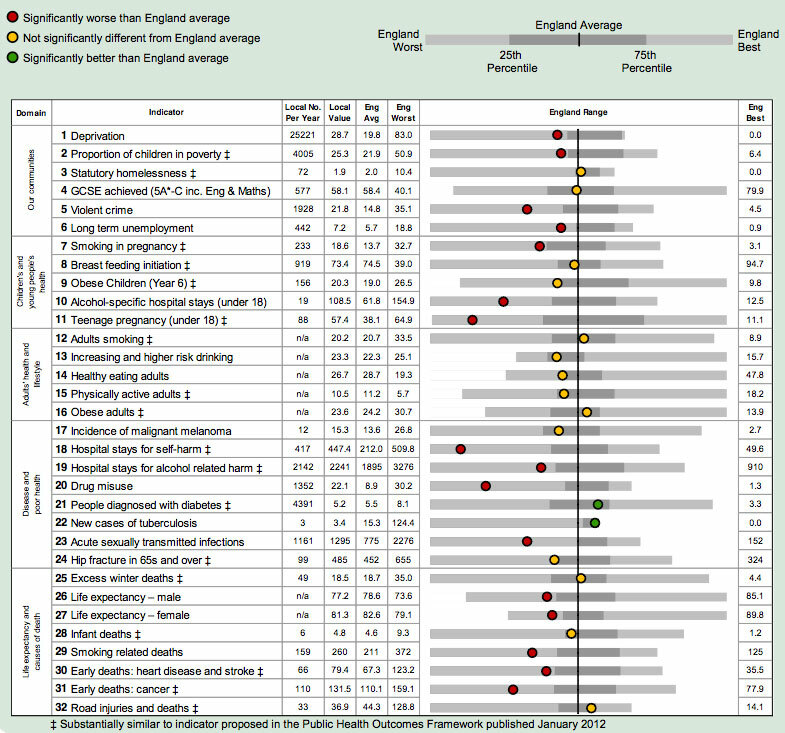 The chart below (click to zoom) shows how the health of people in this area compares with the rest of England. The city’s result for each indicator is shown as a circle. The average rate for England is shown by the black line, which is always at the centre of the chart. The range of results for all local areas in England is shown as a grey bar. A red circle means that this area is significantly worse than England for that indicator; however, a green circle may still indicate an important public health problem.